Load up your Netflix list and get ready for a trip around the world with a cascade of visually lavish food-related movies guaranteed to stimulate your taste buds and warm your heart! For of course though each of these movies is centered around cooking, the food serves as a medium to tell the stories of families, relationships, and life experiences. Here are my top faves! A mixture of documentaries, comedies and dramas, for your viewing pleasure. Film is a glorious medium for food! And food is a magical, masterful medium for story. 1. Jiro Dreams of Sushi (2011) - A critically acclaimed documentary about the eldest son living up to his father’s legacy. You’re riveted to the screen! From director David Gelb, creator of the hit Netflix series “Chef’s Table” (see below). 2. Big Night (1996) - I have watched this movie more than any other! It was released when I was transitioning back from my year’s sabbatical in Italy and about to start culinary school, and it has stuck with me as a very special memory of that time. 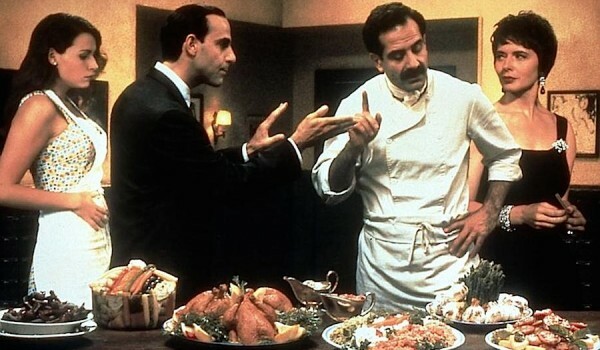 The story features immigrant brothers, chef (Tony Shalhoub) and businessman (Stanley Tucci), who open their dream restaurant called Paradise in New Jersey. They struggle to attract local diners accustomed to spaghetti and meatballs to their authentic Italian menus, and put their all into cooking a feast for one big night likely to decide the fate of their restaurant. The showstopper on the menu is a timpano (“drum” in Italian), a huge torte with layers and layers of pasta, cheeses, sauces, meats and all manner of things. It takes about a day and a half to make. My friend and I decided to do it for New Year’s Eve that year. When we took it out of the oven it was so spectacularly perfect that neither of us wanted to cut it! We asked a surgeon who was at the party to do the honors. The cast is stellar, btw, with Stanley Tucci not only starring, but writing and co-directing, and including Isabella Rossellini, Minnie Driver, Allison Janney, Marc Anthony, Ian Holm and Liev Schreiber. I have to watch this again! 3. Babette’s Feast (1987) - Based on the story by Isak Dinesen, Babette’s Feast was the first Danish film to win the Oscar for Best Foreign Language. Starring the gorgeous French actress Stėphane Audran, it’s one of my all-time favorites. In the late 19th century, a strict religious community in a Danish village takes in Babette, a French refugee from the Franco-Prussian War as a servant to the late pastor's daughters. A truly accomplished chef, she cooks the bland food the daughters are accustomed to for 14 years, until one day she wins 10,000 francs in a lottery and offers to cook “a real French dinner,” a lavish banquet, to tempt the family’s austere, dwindling congregation to indulge in the fleshly pleasures of food and wines. Unbeknownst to her dinner guests, Babette spends every penny she won on the luxurious, once-in-a-lifetime feast. A delicious fable for culinary France. 4. Like Water for Chocolate (1992) - This Mexican film in the style of magical realism is based on the best-selling novel by Laura Esquivel. A fable of forbidden love, the movie is about the beautiful Tita, the youngest of three daughters, who’s required to remain single and care for her mother until she dies. Pedro, her true love, marries her older sister Rosaura, so at least he can be near Tita. Tita is devastated and channels all her emotions into her exquisite cooking, in this seductive, mystical tale. 5. Mostly Martha (2001) - A German romantic comedy written and directed by Sandra Nettelbeck about a beautiful, workaholic head chef. Martha is forced to adjust to major changes in her personal and professional life when her 8-year old niece comes to live with her and a lively Italian chef joins the kitchen staff and intrudes on her monotonous routines. Ah! Maybe now life can happen to the talented but uptight Martha. 6. Eat Drink Man Woman (1994) - A Taiwanese film directed by Ang Lee, the first of his films to be a critical and box office success. Set in Taipei, the film features a widower who is a master Chinese chef with three, very modern, very challenging unmarried daughters. Elaborate, mandatory Sunday dinners become increasingly fraught, as the young women trying to make their way into futures of their own, while their father tries to keep them close. 7. Chef (2014) - An American comedy-drama written, produced, directed and starred in by Jon Favreau, Chef tells the story of a frustrated top chef who quits his job at a prestigious Los Angeles restaurant, buys and converts an old food truck, and drives it across the country to Miami, reconnecting to both his culinary creativity and his son. Food is the medium for this cinematic, witty, fun-filled road trip of a movie. Don’t pass go, don’t collect $200… Watch immediately! Feel good fun. 8. Tortilla Soup (2001) - One of my husband’s and my TOP food movie favorites! Starring the always magnetic Hėctor Elizondo, this American comedy-drama directed by Maria Ripoll is based on the Taiwanese Eat Drink Man Woman (see above); and though set in a Mexican-American family, the two films have many elements in common. The widower-chef fathers, who demand their three adult daughters be present for feasts every Sunday. The challenges of life, love, food and family. Tortilla Soup has an especially gorgeous cooking and music montage. A delight! 9. Spinning Plates (2012) - This move was a game-changer for me. Watching the intimate stories of people overcoming adversity through food and witnessing personal dramas that go well beyond the kitchen blew me away! The website describes it as “...an award winning documentary about three extraordinary restaurants and the incredible people who bring them to life. A world-renowned chef competes for the ultimate restaurant prize in Chicago, while privately battling a life-threatening condition. A 150-year-old restaurant in Iowa is still standing only because of an unbreakable bond with the community. And a fledgling Mexican restaurant in Tucson struggles as its owners risk everything to survive and provide for their young daughter. A riveting documentary about life, food and waste, Theater of Life tells the story of the Refettorio Ambrosiano, its chefs and the refugees and homeless it fed. A temporary soup kitchen conceived by renowned chef Massimo Bottura during the Milan 2015 World's Fair, Massimo invited 60 of the world's best chefs to join him to cook for refugees and the homeless of Milan. All meals were made from the waste food of the Expo. Perfect if you’re in the mood for a 40 minute bon bon. 1. Chef’s Table - Meet culinary stars from around the world in the tintillating series. Season 4 coming April 13. 2. The Mind of a Chef - Producer and narrator Anthony Bourdain explores the creative processes of international celebrity chefs. 5 seasons. What to eat while you watch? Popcorn, of course! There’s only 700 ways to season it, and we each tend to have our favorites. I make mine with olive oil and season it with sea salt. A friend throws some rosemary in. Another uses Nori flakes. I love that! It adds a little salty/briney. Toast a sheet of nori really quickly just above the stove flame. Fold the toasted sheet into a fan, then cut it into little triangles. It’s really pretty sprinkled on the popcorn! You may prefer a little cinnamon with butter or ghee, if you’re a kettle corn type. ALL THESE MOVIES ARE ABOUT FAMILY AND FOOD, THE GLUE THAT BRINGS PEOPLE TOGETHER. iT DOESN’T MATTER IF IT’S GERMAN, JAPANESE, DANISH, OR SPANISH BEING SPOKEN—FOOD IS THE UNIVERSAL LANGUAGE, AND WE’RE TRANSFIXED!